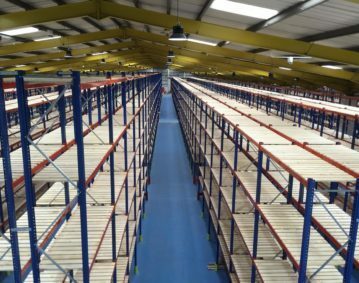 Mobile Shelving systems provide the ideal high-density, storage solution that maximises floor space and storage efficiency. 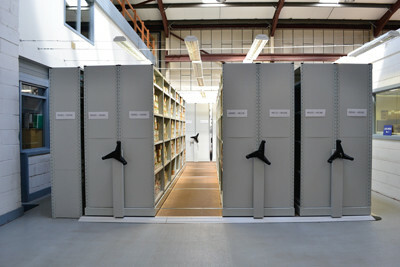 Mobile shelving comes in a wide ranges of sizes and colors and can be designed to fit in a particular space or store a particular number and size of files or objects. The systems come with either push along, cranked drive operation or a powered electrical motor. Idea for a wide range of applications from laboratory, office, testing, or storage of museum or other specialist items or equipment. We can ever have your corporate logo or a picture added to the shelving to create a design statement for your working environment. We not only offer a full design and installation service for your mobile shelving but also provide full after sales care so if you chose to relocate your mobile shelving or move to another facility we can take down package, transport and re install your mobile shelving. 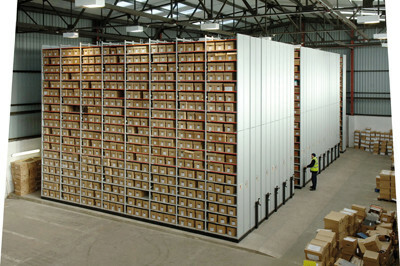 Rolling storage system can create up to 100% more storage capacity for your filing, archiving and product needs. 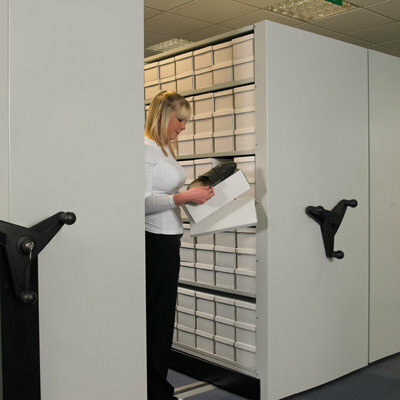 For a demonstration of this type of Mobile Shelving system visit we can arrange a site visit.